The growing use of cloud computing and mobile solutions — and the rise of shadow IT — have added new levels of risk, complexity and cost to securing your agency’s mission and objectives. Serving your users and constituencies requires combatting advanced persistent threats (APTs), cybercriminal activity, spam, malware and loss. In this ongoing effort, many organizations have deployed “point” solutions, effectively managing their security in silos – increasing rather than decreasing risk. 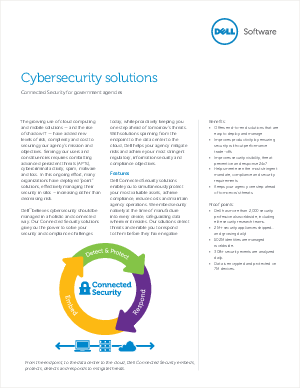 Dell™ believes cybersecurity should be managed in a holistic and connected way. Download this white paper to lean more about how Dell's Connected Security solutions give you the power to solve your security and compliance challenges today, while proactively keeping you one step ahead of tomorrow’s threats. With solutions spanning from the endpoint to the data center to the cloud, Dell helps your agency mitigate risks and achieve your most stringent regulatory, information security and compliance objectives.